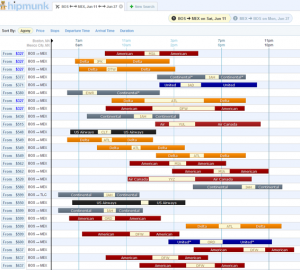 My new favorite flight reservation site is www.hipmunk.com. Maybe it’s because I’m a visual person, but I find the flight display, all on one page, all on the same timeline way easier to use than the long lists that I get from other sites. The prices look identical as well. 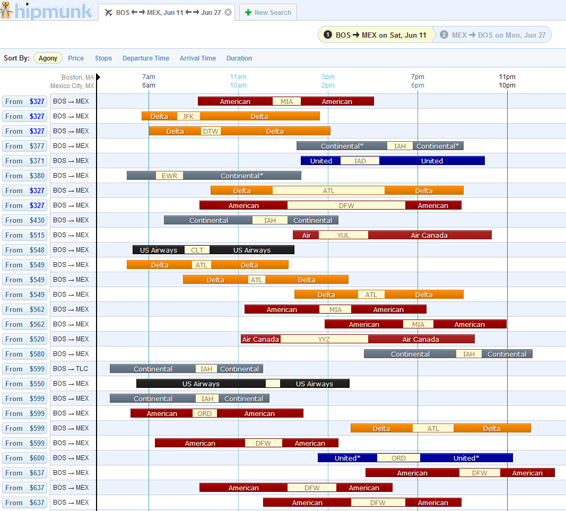 Now, I haven’t actually used hipmunk to make any reservations — and Expedia has come through for me a couple of times when I had problems while on a trip — but I’m definitely going to give them a try and hope their UI skills carry over into their travel service skills. I tried their hotel reservations as well. It has a great map-based interface, but the selection seems a little slim. I was looking for a place in Mexico City, so maybe they’ve yet to fully populate it. Once they do, it will be my first choice as well.